K is for Kids® is a unique student volunteer-based nonprofit 501(c)3 with kids on both the giving and receiving ends of our mission building readers and leaders. The Foundation encourages literacy and a love of reading in children of all ages by enriching their libraries at school and at home and by recognizing students’ reading achievements throughout the school year. Teen leaders and young entrepreneurs, the organization’s primary volunteers, earn community service hours, boost resumes and test their skills in a real-world setting. Through its focused efforts, K is for Kids helps cultivate the skills kids need to be creative thinkers, adventurous problem solvers and visionary leaders. Join us during February’s “Bring a Book, Bring a Friend®” for Children’s Literacy Month when teens host “fun’raisers” to inspire kids to read more & dream more. 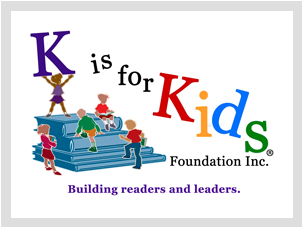 Reading & dreaming, learning & leading, creating & achieving: That’s K is for Kids!